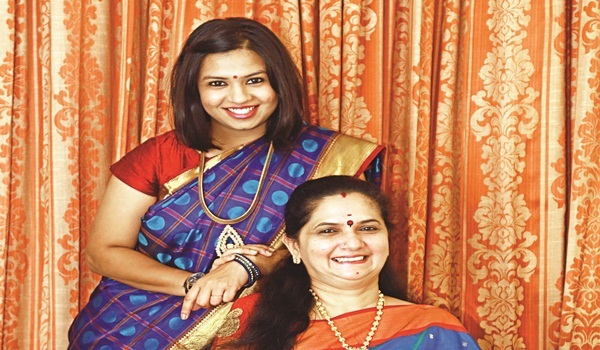 When an engineering graduate and her mother-in-law team up to showcase classic silk saris. MEET the creative force behind Chennaia��s newest kanjeevaram sari brand a�?Pattua�� a�� Shanthi Rajagopal (53) and Shruti Ravindran (27). a�?Although our backgrounds are very different,a�? explains Rajagopal, who runs a successful visa consultancy, a�?my daughter-in-law and I realised our common passion for traditional aesthetics when we went trousseau shopping for my daughtera��s wedding.a�?Ravindran, an engineering graduate who is also a wedding planner spent two years working for her aunt Prabha Narasimhan (the Chennai design entrepreneur known for her striking style). a�?a�?She was my first introduction to the world of fashion, when I learnt a lot about different fabrics. I met everyone from kalamkari artists to Benarasi weavers then,a��a�� she says. Pattu was launched officially earlier this month. a�?Being a traditional family we felt that there was no better day to start than on Akshaya Tritiya. We held a high tea at home for family and friends to introduce Pattu. Our boutique is scheduled to open on June 9 and currently we retail online,a�? says Rajagopal, a Bio-Chemistry graduate. The USP of the new brand is heritage silk weaves in classic colours and motifs. a�?We introduced these saris with a single belief a�� retain tradition,a�? adds Ravindran, an Engineering graduate who has also studied fashion styling (Diploma from ICBI, Chennai). The duo works with old weaver families in Kanchipuram. a�?At Pattu, we want to uphold the traditional goals of the weavers. We have a wonderful collection of kanjeevarams in checkered patterns, Baavanji borders, temple motifs, embellished motifs of peacocks and chakrams, long borders, rudraksham, and Vairaoosi,a�? enthuses Rajagopal. The traditional colour palette sees reds, greens, mango yellow, Paaku (betel nut) and Manthulir ( a mixture of red and green). The duo follow fair trade principles at the workplace. a�?We would like to motivate and encourage the few weavers left in this profession, since passing on design to them is one thing, but translating our designs onto silk lies only in their magical hands! It takes a month and a half (minimum) to weave a single sari for Pattu,a�? says Ravindran. a�?Our first collection focuses only on traditional pattu saris but we also hope to include a line of Ahimsa (ethical) silk soon,a�? smiles Rajagopal.